Embodying the "Irishness" of our community! Each year we select a Hutt Valley Rose of Tralee to represent us at the National Final. The 2018 Hutt Valley Irish Society Rose of Tralee is REBECCA McKEOWN. The Rose of Tralee is a national event tied to the International Rose of Tralee. 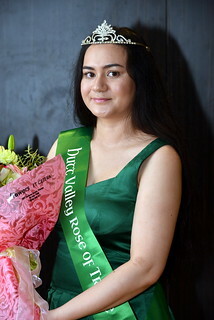 Each year local Irish societies hold events at which a local Rose is selected to go forward to represent them at the National Final, hosted each year by one of the local societies. The National Selection event culminates each year with the naming of a New Zealand Rose of Tralee, who, in turn, will travel to the International Festival representing the Irish community in New Zealand. She will be part of an international event with other Roses similarly selected from around the world. The event is about selecting young women who epitomise the heritage and values of the Irish community in New Zealand. You can meet our current Hutt Valley Rose, Rebecca McKeown, or send her a message of congratulations. The Hutt Valley Irish Society has a proud record in the event, having won the National Title in 2002 (Vivienne Lynch), 2005 (Esther Budding), 2006, (Emma Coffey), 2008 (Aislinn Ryan), 2011 (Ailbhe Ryan), 2014 (Lisa Bazalo), and 2016 (Hannah Greally). You can meet these recent Hutt Valley Roses.